We had a great time in Papua New Guinea and its something that we saw there that gave inspiration to this post. 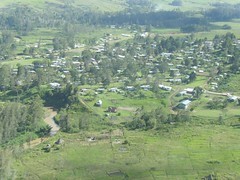 We visited the Summer Institute of Linguistics (SIL) mission base in Ukarumpa in the PNG Highlands. It is the largest mission base in the world and supports the translation and literacy work in Papua New Guinea (with 869 languages), the Solomon Islands and Vanuatu. It is home to around 1000 people, so as expected, it has its own primary and secondary schools. With the schools comes the school libraries, as well as a separate research library for the work SIL does and a public library for personal and recreational needs. We visited the primary school and research libraries and one thing of obvious note was that they were running on different LMS’s. Both my husband and I immediately thought about the wasted opportunity this was. My public library is in an LMS consortia and our borrowers enjoy the benefits of having access to the collections of 15 public libraries, through one catalogue search. At Ukarumpa, they have a small geographic area in a controlled environment – ideal for enabling cross borrowing between the libraries, but that facility is not available. Who would such a thing be good for? Initially I thought mainly for the secondary school students, who may have research to do on the work of SIL or on more specialist topics relating to Papua New Guinea (the research library’s survey maps were wonderful). But then I started realising that it could go much broader than that. The public library is not large, so a base resident looking for a book from their childhood to read to their children, might find it at the primary school library. Someone wanting to satisfy their curiosity as to the history of a particular time period may find it at the secondary school library. Someone studying literature might find related works at the public library. How could this translate into our environment? As I said, my public library already has access to both our consortial library catalogues and then broader to the greater Victorian public library network with Library Link Victoria. But what about other libraries and what they can access? I know the National Library of Australia has a vision for all libraries to have their catalogue holdings live on Libraries Australia and I love that vision, but it could be overwhelming for the borrower wanting to find something in their local area. So what am I suggesting? I keep thinking that my kids at school could find it useful to be searching their school catalogue and at the same time, if required, be able to see the holdings of their local public library too. I would like to see our public library catalogue able to search the local university for anything that our library doesn’t hold. I’d like to think that all the different sorts of libraries could overcome their differences and restrictions, in a way that is still fair to their primary users of course, to make their materials available to whoever wants it. Pipe dream or not? Love to hear what you think.